Goji berries (Lycium barbarum, not to be confused with Lycium chinense), also known as Wolfsberry, are native to China, Mongolia and the Himalaya, especially Tibet. They are well known in the Oriental materia medica and were used for more than 6,000 years. Since ancient times, goji berries were used to promote overall health, protect the liver, improve blood circulation, improve the sexual function and fertility, and boost the immune system. With the ORAC value of 25,300 in 20 grams of fresh fruits, goji berries are an exceptional source of antioxidants, especially beta-carotene and zeaxanthin. Since ancient times they were used by the Chinese to improve and protect the vision. This was ages before the modern science discovered that the central role of zeaxanthin in the body is to protect the eye from macular degeneration. Goji berries are considered to be a super food that is rich in Vitamin C, Vitamin E, Thiamine (Vitamin B1), Riboflavin (Vitamin B2), Niacin (Vitamin B6), and Betaine. They contain fiber and 19 amino acids, eight of which are the essential amino acids that cannot be produced by the body. 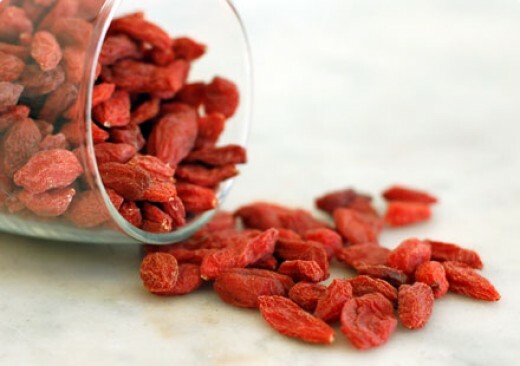 Moreover, goji berries are a good source of minerals such as calcium, magnesium, potassium, and phosphorus, as well as the trace minerals, among others iron, zinc, copper, manganese, chromium, and the immune system supporting selenium and germanium. The seeds of goji berries are a good source of the linoleic acid. Goji berries also contain the anti-inflammatory beta-sisterol that reduces blood levels of cholesterol in the body. The Lycium barbarum polysaccharide is a unique agent that is known for its potential to increase the production of the human growth hormone, HGH, by the pituitary gland, hence the rejuvenating potential of this power berries that was attributed to them by the ancient Chinese. Goji berries also contain other active agents, such as cyperone and solavetivone, that have anti-bacterial and anti-fungal properties, the ability to increase the activity of the white blood cells, or the ability to enhance the liver and digestive functions in the body. A compound called physalin has a remarkable ability to enhance the activity of the immune killer cells and to counteract leukemia and hepatitis B. Goji berries have a very law glycemic index, GI, and are known to regulate the blood sugar and metabolism. The health industry launched products that not only promote the overall health, but also support weight loss and healthy metabolism. The claims are often very dramatic, but the use of goji berries as a weight loss formula is not very well documented and caution is advised, as the products may contain other ingredients and not much of the Tibetan goji extract. Mix all the ingredients, including the soaking water, in a blender or a food processor, adding the flax oil in the end. Enjoy! If you are struggling with your weight, you may want to explore the market for the goji products for weight loss. Remember, however, that supplements cannot replace exercise and a healthy and balanced nutrition. Consult you health care provider before you begin supplementation with a product that you never tried before.